Ibanian-born Agnes Gonxha Bojaxhiu went to Ireland to join the Institute of the Blessed Virgin Mary when she was just 18. It was here she took the name Teresa, for Little Teresa of Lisieux. Six weeks later the young nun traveled to India, initially as a teacher but later requesting permission to work with the poor in the slums of Calcutta. 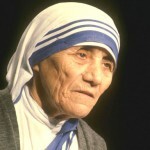 After studying nursing, Mother Teresa moved into the slums and founded the Order of the Missionaries of Charity in 1948. Numerous centers were opened by the order to help the blind, lepers, cripples, and the dying. 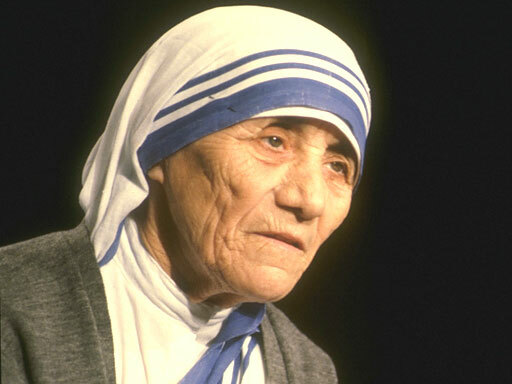 Mother Teresa received the Nobel peace prize in 1979 for her work. 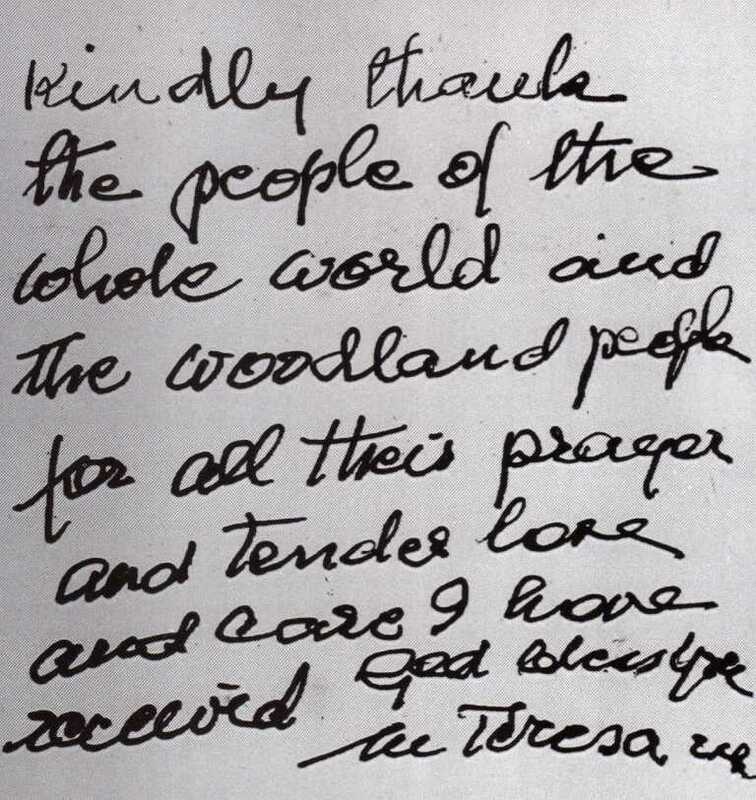 Mother Teresa’s handwriting reveals warmth and compassion. The large writing size may partly have been a result of her poor eyesight, but the well-shaped, round forms and pastose (thick) strokes attest to a fullness of feeling and a sense of fun. The writing tends to move uphill, despite dipping down at the ends of some lines, which suggests an innate optimism in the face of difficulty. She knew how to use her sense of humor in order to get what was needed. This is someone who enjoyed the public eye and was at her best when able to use her cleverness—seen in the unique forms and horizontal movement—to achieve her goals. The round, full letters are a sign of a strongly emotional nature, one who cared deeply about people and shared their feelings. Some middle-zone letters are wider than they are tall, indicating that she sometimes took on more than was reasonable. more appealing to her. Nonetheless, the upper zone is tall and wide enough to allow for innovative thinking. De-emphasis on the lower zone is common in people who have chosen a religious life. Their focus is less on the physical and more on spirituality. This can be seen in a very tall upper zone or, as in Mother Teresa’s script, in an emphasis on the middle zone of practical, day-to-day activities. The self-discipline evident in the strong t-crosses, combined with the solid, dark strokes, indicates strength of purpose in one who was willing to work long and hard to attain her objectives. Mother Teresa had great determination and an ability to seek out the material necessities that made life easier for those to whom she ministered. Witness the hooks at the ends of words and final strokes plunging into the lower zone. Although she was not without conflict, seen in the variable slant, her chief motivation was love, manifest in the large, rounded forms and firm rightward movement. What a lovely handwriting! I would have expected a person faced with as much human pain as she has been to adopt a more irregular, complicated way of putting thoughts to paper. She must have been a wonderful woman to stay optimistic, determined and funny! Her handwriting looks very “youthful”.